Loved Vader's book!! Was so very glad that the story was as big and wild as the character himself. Took me a while to warm up to Cherie since she was grinding up sweet Vader's heart but she pulled it out in the end. I definitely recommend this one. If a writing style had a tactile or sensory image to accompany it, I'd picture the glass-smooth, aquamarine Caribbean waters on a cloudless, sunny day. Or melted, rich Belgium dark chocolate flowing in a fountain. Or maybe the feel of the finest silks floating over one's body... it's just that exquisite! Who DOESN'T love Vader... that big teddy bear! I mean, come on! Vader's been in this on/off relationship with Cherie for, what seems like, forever! 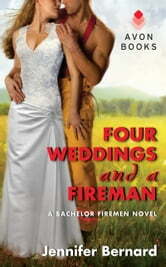 Everytime he attends a fellow firefighter's wedding, his internal mush-o-meter overflows and he proposes to Cherie. Everytime Vader proposes, Cherie turns him down as gently as she can. Cherie's got a seriously screwed up hidden past that shows up on her present-day doorstep to wreak havoc of epic proportions. Her past makes "drinking the Kool-Aid" seem tame by comparison. There was one point of predictability, but I am not sure if EVERYONE would foresee it or if it was just where my mind took me. Overall, this is a fantastic read. I love Ms Bernard's smooth writing style. I lose sleep when I get my hands one one of her books & eagerly (greedily) await the next one.